While it would nice for someone to simply tell you what the best air compressor is, the question is actually impossible to answer. 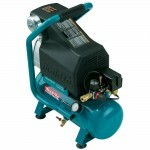 Air compressors come in a wide variety of types, sizes, and performance. 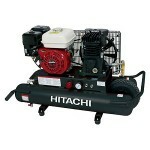 What may be a fantastic unit for light duty use around the house may be completely useless at a construction site. 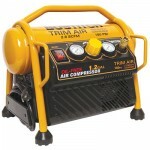 At Air-Compressor-Reviews.net, we provide information and reviews on a large assortment of models and show you where to get the best deals and who to avoid. To make it easier for you to begin your research of only the top rated air compressors for your needs, below we offer a “cheat sheet” of some of the most popular compressors for consumers and contractors. Clicking on the image or model will take you to our review of that specific compressor. Click on the column headings to sort. 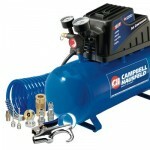 If you’d rather skip ahead to our air compressor buying guide, just click here. 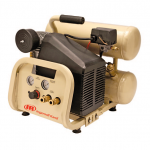 Whether you are a home user, private contractor, or commercial enterprise, getting the right air compressor for your needs is essential to fulfilling your goals. 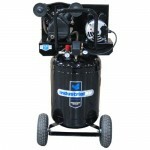 For example, the average home user will never need the size or cost of an industrial air compressor, while the private contractor needs to have a unit that performs adequately but is versatile enough to work in multiple environments. 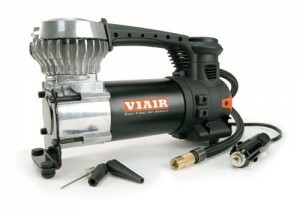 Compressed air is a great way to use almost any type of powered tool. 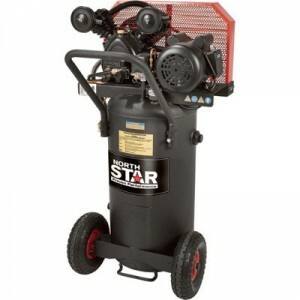 No matter what setting the air compressor is used in, you will always have the ability to use multiple tools with a single hose, making it possible to run one air line to a work bench or labor area and then quickly swap tools. 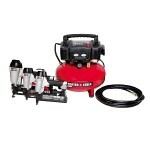 Pneumatic tools are quieter and less expensive than individually powered tools. 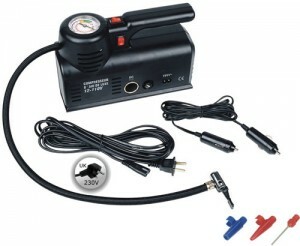 Additionally, using air the as the power source makes the tools you use safer and provides you with a way to control emissions. Pneumatic tools are capable of power and speed that may not be available in equivalent tools powered by electricity or liquid fuels. 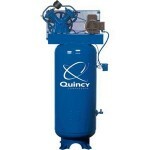 On the surface, the Standard Cubic Feet Per Minute of an air compressor may seem to be the most important decision, since this determines how much air pressure you can expect at any given time. 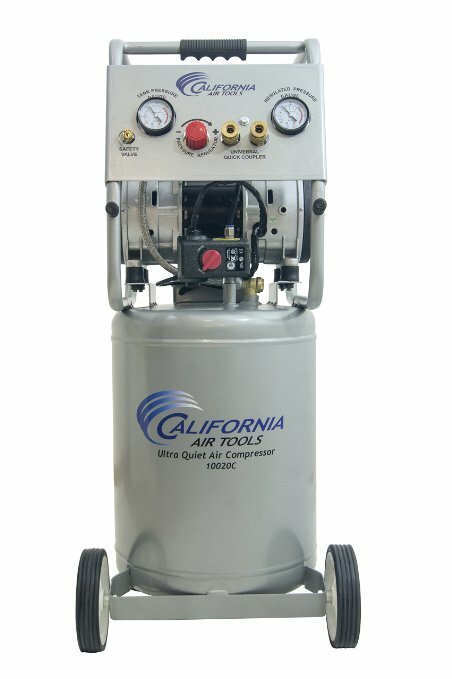 For commercial and contractor purposes, the SCFM of the air compressor has to meet or exceed the rating of the tools you plan to use. 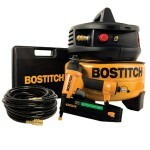 The simple calculation for this is to multiply the highest SCFM rated tool you will use by 1.5. 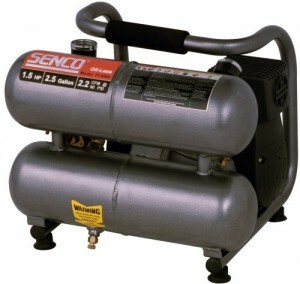 Since the compression of air compressors is measured by pounds per square inch, compare compressors by the SCFM rating when the tank is filled to 90 psi. 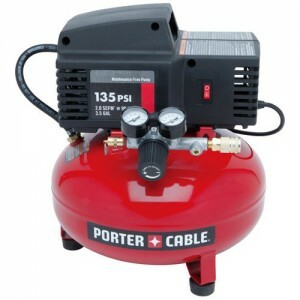 Except for small air compressors, you can set the desired psi on the tank up to the maximum rating of the compressor, which is why your initial calculation is multiplied by half again the desired pressure. However, using multiple tools simultaneously will also increase the amount of compression power required. 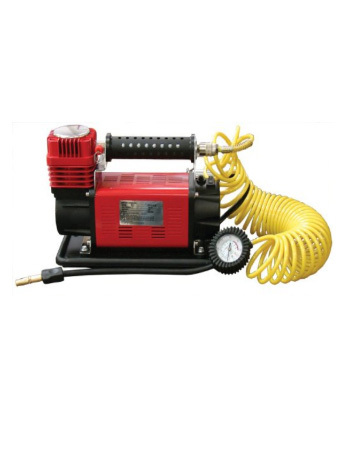 To allow for multiple tools, you will need to increase the SCFM of the air compressor, the rate at which the tank is able to refill based on the horsepower of the compressor motor, or both. What these two figures mean is simpler than it may seem: SCFM determines how often the motor has to power up, while the HP determines how long the motor has to run in order to fill the tank. Both of these factors will be affected by the first real consideration you have to make, the tank size. Deciding on the right tank size is straightforward once you have calculated your general needs according to the required psi or SCFM. The larger the tank size, the faster and longer you can do the work. Once the tank is drained below the psi setting. 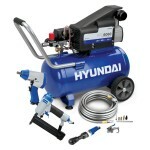 Where pneumatic tools are concerned, a tank that is too small will result in the tool “winding down” as the tank empties. It’s as simple as that. A higher hp can offset this degradation somewhat, at the cost of more wear on the compressor motor. 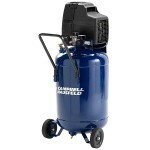 Your goal is to work longer without forcing the air compressor to run constantly. If your sole purpose is to inflate a tire on occasion, you have little or no use for a storage tank at all. To explain this, coin-operated compressors such as you see at convenience stores do not include any tank capacity at all, and a very low HP rating. 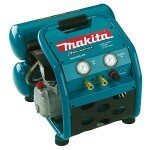 It may take several minutes to fill a tire to 32 psi or higher with this type of compressor. 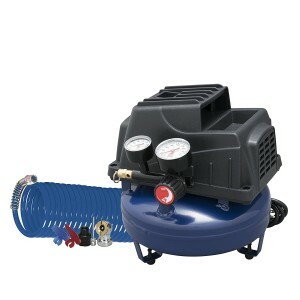 In contrast, the compressor used by a commercial tire company can inflate a tire almost instantly, because the air compressor has a holding tank that is filled to a greater volume at the desired psi setting. Think of the tank as a balloon that releases air slower and slower as the initial psi is drained, meaning that a large tank will sustain the necessary psi for a longer period of time. 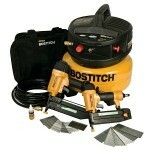 A small tank, from 2 to 6 gallons, is fine for using a single nailer. 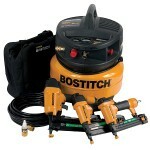 If you intend to use multiple nailers, increase the size of the tank by that amount for each tool. 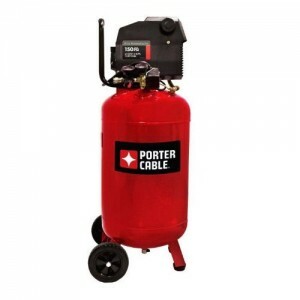 Similarly, if you going to use a pneumatic tool which operates at a constant rate, a larger tank will give you smoother, more dependable results. 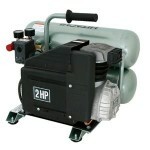 There are 4 primary variations on the pump type used on air compressors. Each type is designed to provide a specific advantage. Which type you need will depend on factors such as your usage frequency and available downtime for maintenance. The maximum required psi for your projects will also play a factor in whether you need a single or two stage air compressor. 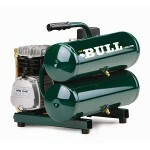 Uses one or more cylinders which fill the tank as a single function. The first stage produces an initial psi value that is channeled thugh the second stage to increase the psi value. This allows longer sustained operation without loss of tool performance. System lubrication is provided by use of specially coated pistons and rings. 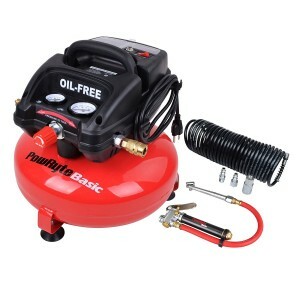 Oil free systems tend to be smaller and lighter, but also have a shorter estimated life cycle before the air compressor has to be rebuilt or replaced. 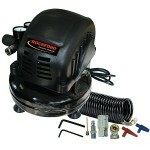 Like a lawn mower, this type of system has an oil tank that lubricates the moving parts of the compressor motor. Oil Lubricated systems are usually larger and heavier, but are designed for a longer life cycle provided the oil is changed regularly and kept at the designed fluid level. There are 2 primary ways to power an air compressor. 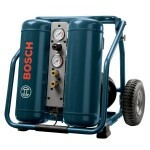 DC-powered compressors are available, but are not useful for any type of serious applications. 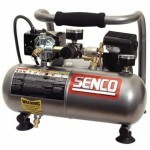 Such compressors do not offer the high speed or pressure you would need with pneumatic tools or sprayers. 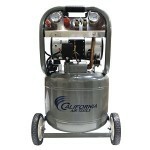 AC powered compressors are available in both 110 and 220 volt models. 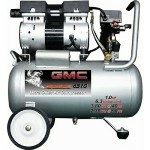 Typically, 220 volt air compressors provide a higher hp rating, while 110 volt compressors are limited to 2hp or less. 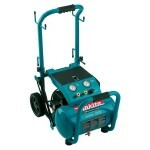 Electric compressors are best for areas with limited ventilation and situations where weight and portability are at a premium. 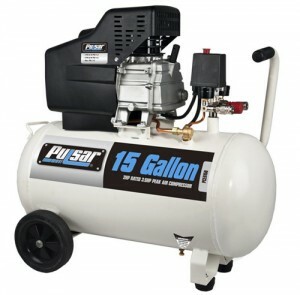 Air compressors that operate using liquid fuel tend to be powerful, and have the advantage of being used in locations where AC power is not available. 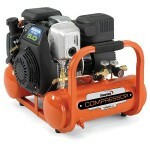 This type of compressors requires plenty of ventilation. 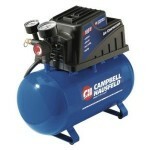 Additionally, gas powered compressors need to be used in level, stable environments. This type tends to be smaller and lighter. The tank size is generally limited to to 30 gallons or less. 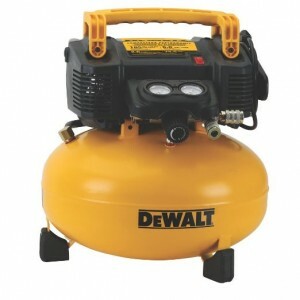 Portable air compressors may not be sufficient to power multiple pneumatic tools for an extended period of time, but they are less expensive and work well for home use and situations where the compressor will be needed in more than location on a regular basis. 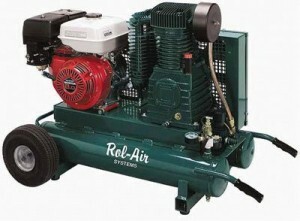 This type of air compressor is fixed to a concrete slab or other platform, with hoses piped to various locations. 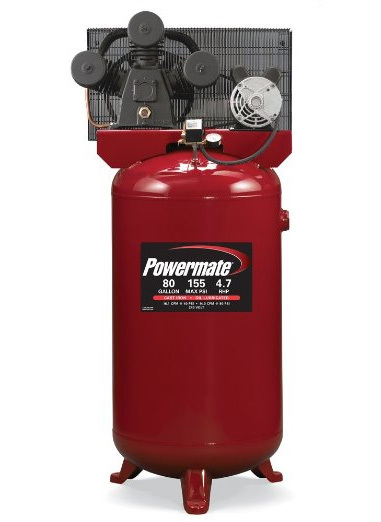 Stationary compressors generally have tanks of 20 gallons or more, and are able to provide sustained psi for longer durations. 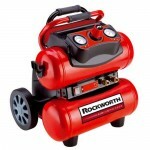 This type of unit is more fitting for commercial and industrial applications where multiple pneumatic tools are required, or individual tools have to maintain a fixed performance level for extended periods of time. Companies that have been in business for many years will generally have an established reputation at stake. 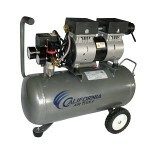 Their products may cost a little more than a generic model, but you’ll get more usage out of the air compressor. 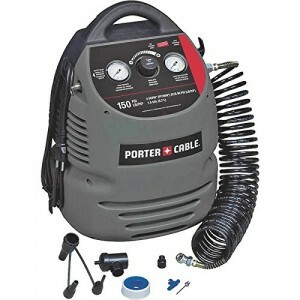 Big brands that you are familiar with, such as Porter-Cable, are usually more familiar with what a contractor or commercial user needs to accomplish. 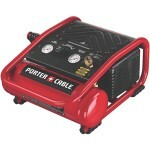 Incidentally, Porter-Cable and DeWalt are both owned by an even bigger name: Stanley Black & Decker. Do they manufacture other products? 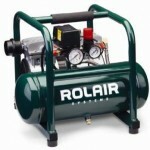 For your purposes, you specifically want to know whether the company has a full line of air compressors. If they only sell a single model, it may only be available for the purposes of competing with other companies, and may not even be manufactured by the brand it is marketed under. You can purchase from a reseller, but try to avoid buying a machine that is re-labeled under a reseller name. 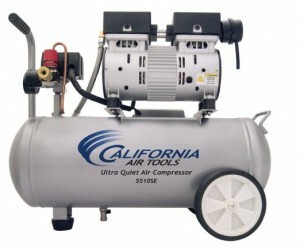 Where was the air compressor manufactured? This question can be important for many reasons. If something goes wrong, you might be able to get the repairs done locally if you purchased a machine manufactured in the United States. 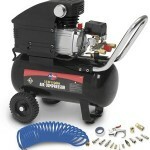 All air compressors will have some sort of manufacturer’s warranty, but you may have trouble having that warranty honored if you have to ship it overseas for repair or replacement. What materials are used in the manufacturing process? 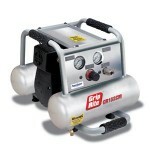 If you are going to do heavy duty work, you need an air compressor that can stand up to the workload. If you are buying a portable one, buying a model made from cast iron may be self-defeating. 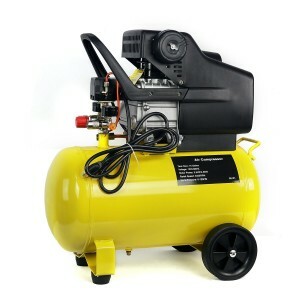 And if the air compressor is going to be used in an area where a lot of work is being done or heavy equipment being used, the air compressor has to be able to take a few knocks without falling apart. Does the company support the product? 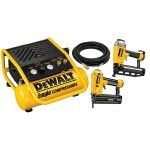 Look for a company like DeWalt, which has a large distribution network. This type of company will usually sell brand name parts and accessories, either by direct sales or through their authorized resale partners. 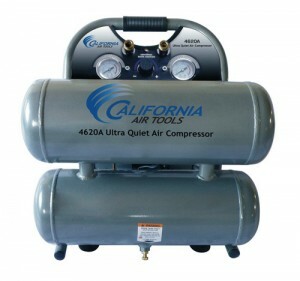 Additionally, if you are buying through a reseller who offers several different brands, make sure that the company you are buying from is knowledgeable about air compressors. For example, if you need to ask a specific question about the machine before you buy it, you need to be purchasing from a company that is both willing and able to answer your question or take the time to get the answer for you. 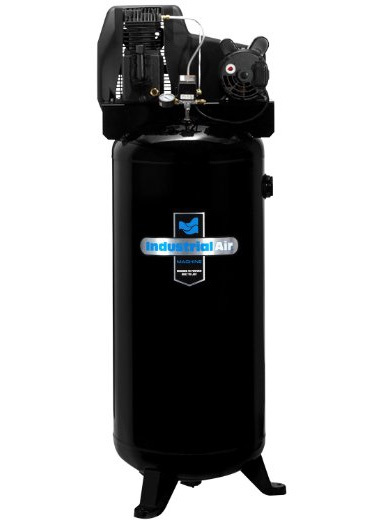 Now that you have a better understanding of the type of air compressor you may need, browse our site to read reviews, specifications, and information on what’s currently available. Be sure to check out our Comparison Table to help you quickly find the right unit for your needs. 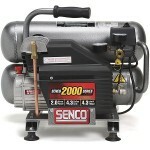 I am looking for 220 volt portable air compressor. Which brand that you can recommend? My budget is between $100- #300. Your help will be much appreciated. Thank you. There are many good ones in this budget. 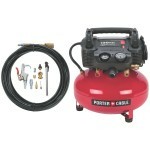 I will recommend on http://www.air-compressor-reviews.net/porter-cable-pxcmf220vw-oil-free-review/ . It may be very useful for you. Nice review. I prefer the Two Stage pump type btw. 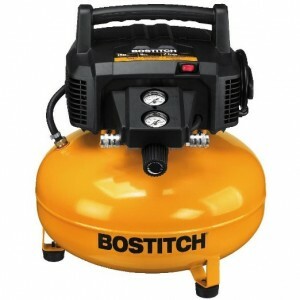 What will you suggest for best small air compressor in low budget?